Whether your new address is just around the corner or across the state, NorthTexasMovers.net can be trusted to move you and your belongings with the consideration as if it were our own possessions. Locally owned by North Texas Police Officers Policemanmovers.com, we are fully licensed and in compliance with all regulations as set forth by the Texas Department of Transportation. We provide moving and packing service to both residential and commercial clients throughout the state of Texas. We are proud to have earned the trust of thousands of happy Texas residents for over 10 years. 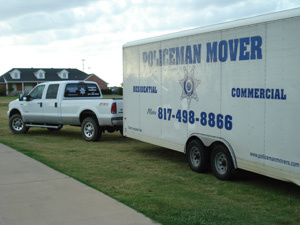 The North Texas Movers team at Policemanmovers.com is staffed by reliable, skillfully trained moving professionals to ensure that your move is an easy one. Whether you are needing a residential move in North Texas, moving from one apartment in North Texas to another, or have an office move or commercial moving project, NorthTexasMovers.net moving company will provide you with an affordable and professional move. North Texas led the nation in population growth for the second consecutive year, adding more than 146,000 residents in North Texas from July 2008 to July 2009. North Texas had several counties among the nation’s fastest-growing in population during the past decade. In 2008, North Texas posted a net gain of more than 91,100 jobs, according to data from the Texas Workforce Commission. The four-county Dallas-Fort Worth area saw its total non-farm employment grow to 6.07 million by December, up from 5.98 million in December 2007. Whether you are moving across town or across the state, changing homes can be hectic, exciting and certainly stressful. Rest assured you've come to the right place for assistance and information for your move in North Texas or to any city or town in Texas. Policemanmovers.com can take the stress out of your next important move.